Today, over 95% of police departments in the U.S. employ the use of body cameras. In departments with around 200 active officers, that can translate to almost 800,000 videos per year – and as a result, over 30 terabytes of rich video data that needs stored. 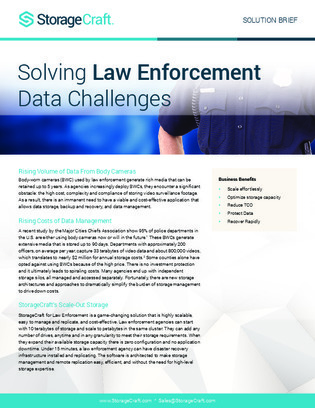 Click inside to learn about a highly-scalable and secure storage platform designed to accommodate the specialized needs of today’s law enforcement departments – including the massive data requirements of body cameras – without straining budgets.